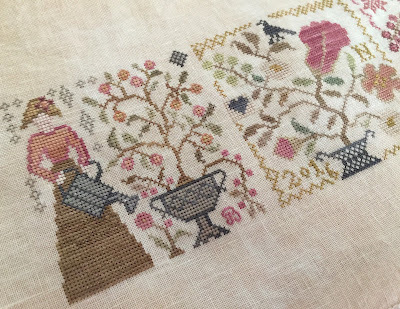 Love Never Fails by Barbara Ana Designs using 40 ct. Vintage Meadow Rue and DMC (1 over 2). Queen of Harvest by With Thy Needle & Thread using 40 ct. Legacy by Picture this Plus and various cotton hand-dyed threads (1 over 2). Little Sheep Virtues Joyfulness by Little House Needleworks using 40 ct. Vintage Examplar and DMC (1 over 2). Isabella Fox by Gigi R using 40 ct. Vintage Sand Dune and various hand-dyed silk threads (Attic Needleworks conversion - 1 over 2). Wheaten Wrap by Anne Hanson using Knit Picks Palette in Huckleberry Heather (size US 4 Nova Platina Interchangeable circular needles). Blueberry Waffle Socks by Sandy Turner using Hedgehog Fibres Sock in Teacup (Size US 1 Nova Platina circular needles). Hi Nicole, I'm brand new to stitching and I'm so happy I found you online! I just love your choices and colors and I'm hoping to take stitching up after being so inspired by your beautiful work! I love your knitting as well! Absolutely stunning! Thank you so much for putting together these amazing podcasts! I'm hooked and I look forward to each and every new one posted! Christmas blessings to you and your's and happy stitching and knitting to you! Hi Tam, I'm so sorry, I no longer have the chart. I sent it on to a friend. Thank you for your kind words! Sorry, I couldn't help you!